From the ‘Jocelynang Baliwag’ of Tagalog revolutionaries under the Spanish colonial rule to the ubiquitous ‘Bayan Ko’ of protesters under the Marcos dictatorship, the kundiman had already had its run at being political propaganda. 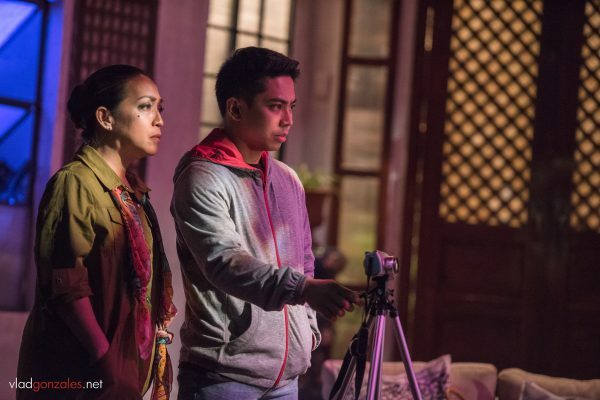 UP Playwright’s Theatre’s The Kundiman Party is, more than anything, a rumination on how a thing of the past could fit in the realm of the Millennial, at a time when protest action couldn’t be more necessary. Maestra Adela Dolores (Shamaine Buencamino), from behind the curtains of La Scala to the makeshift platforms in Mendiola, is an amalgam of every artist who didn’t let their art be misaligned and become merely secondary to political agenda. In the wake of her fervent defiance of the dictatorship’s regime, in spite of the fame its patronage definitely entailed, she ultimately went into recluse and instead became a maestra of the kundiman. Years later, Bobby Valderama (Kalil Almonte), beau of her student Antoinette (Miah Canton) and son of infamous Senator Juancho Valderama (Teroy Guzman), met the Maestra and became wholly fascinated with the kundiman. In the process, he discovered her staunch government opposition during the People Power Revolution. Being a key person in anti-Duterte protest action, Bobby convinced the Maestra to do a private interview, capturing on film her unadulterated musings on politics, art, and every sacrifice in between. But when Bobby hastily uploaded the video online without the Maestra’s consent, every politically-active member of The Kundiman Party—a group of the Maestra’s former students-turned-amigas—is caught unaware, their petty bourgeois sensibilities and tendencies cast into tumult. Maestra Adela told Antoinette in a lesson that there were only three aspects of a kundiman performance that really mattered to an audience. First, there should be enough spectacle and detail to the visual experience to pique one’s interest from the get-go—which Mitoy Sta. Ana’s production design accomplished to a tee. From a poster of Bellini’s Norma to every capiz shelled window pane, the audience invariably finds itself in a hyperrealistic upper-middle class Filipino residence. Add to that Monino Duque’s lighting design and Steven Tansiongco’s video work—both of which also illuminated another Quintos-Santos collaboration, Angry Christ—and you get incisive imagery at par with the kundiman of yesteryear. Second, a kundiman should be delivered with clarity. The fully realized ensemble landed every scene succinctly, with every emotion thoroughly crystallized. 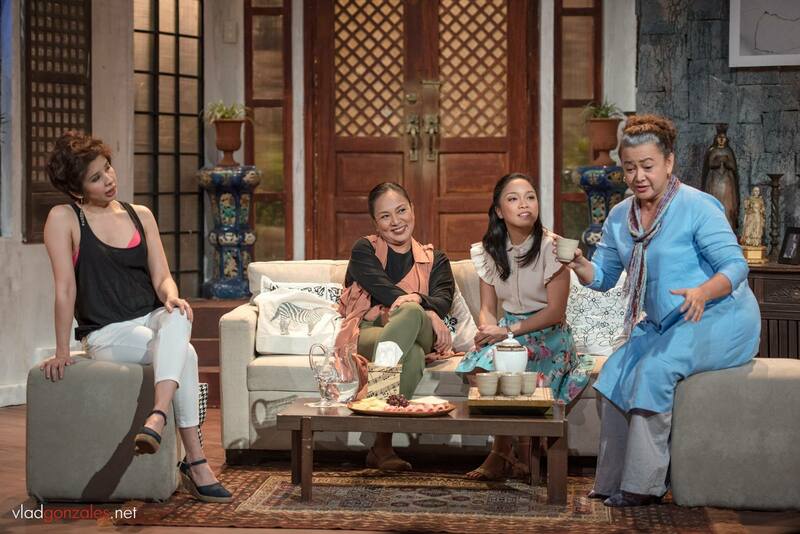 Quintos’ script explored the multitudes of a middle class psyche: a very socially adept and charismatic Mitch (Jenny Jamora), a politically stern yet heedful Mayen (Frances Makil-Ignacio), and an acquiescent but empathetic Helen (Stella Cañete-Mendoza). Each characterization was sufficiently fleshed out, from Helen’s subtle body language to Mitch’s riotous quips. More importantly, the cast maintained a level of nuance to remain believable—save for a very in-your-face Bobby, almost compromising the ensemble’s evenness. Despite this, Bobby provides most of the thrust to the narrative that he so meticulously tailored to fit his own. Lastly, a kundiman should be felt. If anything, The Kundiman Party is effectively affective. With humor as a device, the play established a strong connection with its audience, allowing the material to remain downright relatable. As the play progressed, Quintos’ play on situational contrasts (for one, Maila’s tragedy compared to the Party’s petit bourgeois fears, which are valid nonetheless) worked to magnify the narrative’s self-critical nature. 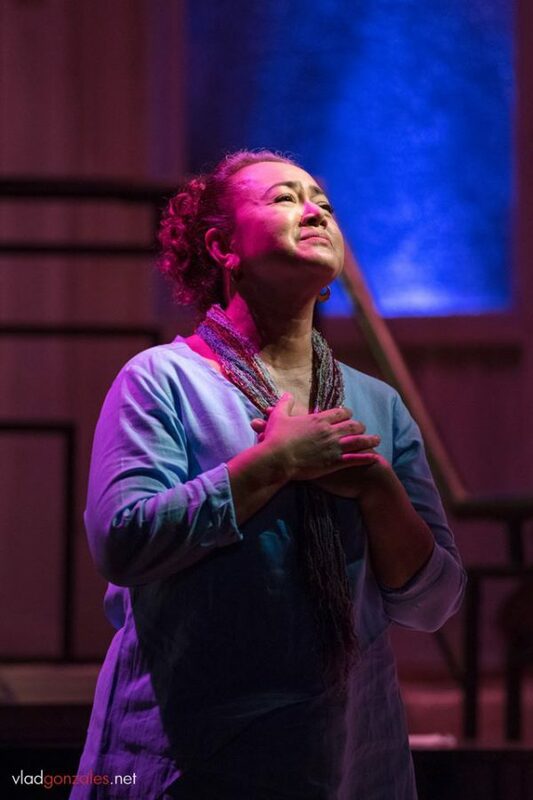 Of course, at the center is still the heartfelt kundiman (rendered beautifully by Miah Canton and Rica Nepomuceno), strengthening the social commentary with Abelardo’s Mutya Ng Pasig and Nasaan Ka Irog among the play’s repertoire. 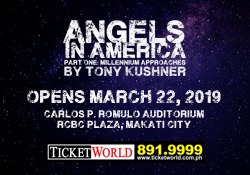 The play is more than just an homage to the kundiman. It provides a reflection of how resistance manifests in this social media-driven present, without ever taking the moral higher ground. It asserts the role of art in humanizing the unifying struggle that had already started to seem foreign, despicable even, to an entirely different generation from the Maestra’s. The Kundiman Party is, by virtue, a kundiman in itself—the vivid landscape of a suitor’s unfaltering devotion to his muse, paralleling the lush nationalistic sentiment it so thinly veiled. Floy Quintos’ swan song might just be his career’s pièce de résistance, that its call ‘to resist’ in addition to Nick Joaquin’s ‘to sing and to remember’ couldn’t be more fitting. The show will be running until April 29 at the Wilfrido Ma. Guerrero Theater of UP Diliman.